Last week I attended ‘Frontline resuscitation’, a one-day conference hosted on by the Military Medicine Section of the Royal Society of Medicine (#RSMFrontline). 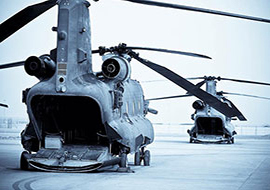 Its aim was to ‘showcase cutting edge developments in resuscitation medicine and provide understanding of how these can be translated to military medicine’. I was one several civilian attendees keen to benefit from some military-style elite education. A wide range of blockbuster topics were covered including sports cardiology, latest research in trauma resuscitation (including SAAP – wow), performance psychology, and ECMO in cardiac arrest. Educational pearls and inspiring stories came thick and fast. I was impressed with the quality of presentation design, and enthused by the shared optimism for the future of resuscitation medicine amongst the speakers and audience. The day had an exciting, bouncy vibe. The phenomenon of sudden cardiac death (SCD) in athletes has huge crossover relevance to the very exercise-heavy business of being a soldier. Professor Sharma delivered a compelling argument for devoting more NHS resources to screening for/treating these patients despite their rarity, as it amounts to a considerable number of ‘life-years’ lost. This point was re-enforced by a distressing video showing a world-beating young basketballer collapsing and dying in the arms of his team-mates. Of course aetiologies vary, but they can be broadly categorized into ‘structural’ and ‘electrical’. The important structural pathologies are hereditary diseases of the cardiac muscle – hypertrophic cardiomyopathy (HOCM) and arrythmogenic right ventricular cardiomyopathy (ARVC is the most common cause of SCD in Italian athletes), or vasculature – anomalous coronary artery origin. Prior to hearing the talk, I had erroneously believed that HOCM was the most common cause of SCD, but in fact electrical abnormalities like Congenital Long QT Syndrome, Wolff-Parkinson White Syndrome and Brugada Syndrome account for far more. Unlike structural pathologies, these conditions are impossible to pick up at autopsy, and so get labelled ‘unascertained cause of death’. It’s a guarantee, therefore, that we grossly underestimate the burden of these ticking time-bombs. Clear take-home message: do not underestimate the importance of the humble 12-lead ECG. Alongside enquiring about exertional symptoms (chest tightness, disproportionate shortness of breath, palpitations, syncope, dizziness) and any family history of SCD, the ECG is the crucial component of screening. It reliably detects electrical pathologies, and raises suspicion for structural abnormalities – in HOCM approximately 95% will have an abnormal ECG. Of course, there will be false positives (13% of black athletes have a grossly ischaemic looking ECG with ST elevation followed by T wave inversion in leads V1-V4 – distance running legend Mo Farah’s 12-lead was used as an example) and false negatives, but where screening programmes have been introduced, they have proven a major success in reducing SCD. 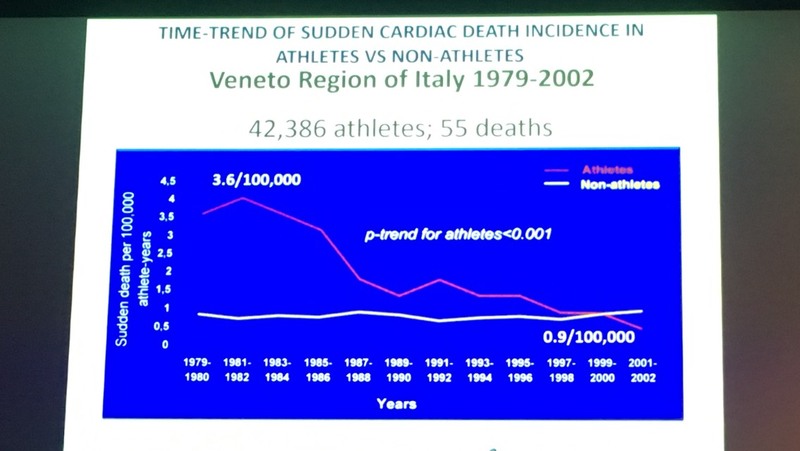 In Italy, they have a state-sponsored general population screening programme which has reduced SCD in sport by more than 90% over the last 30 years. Routine general population screening is not on the NHS unfortunately. Screening is performed by charitable organisations like CRY, or by high performance sports institutions such as the Football Association, English Institute of Sport, Rugby Football Union, and Lawn Tennis Association. Most SCD sufferers are recreational sportspeople, and therefore miss out on being routinely screened. In the ED, we see countless children and young adults coming in from sport-related injuries and other non-cardiac presentations. We’re arguably more exposed to the population vulnerable to SCD than GPs and cardiologists (i.e. under 35s who take regular exercise). Perhaps we should be taking the opportunity to perform ECGs even though it might not be relevant to the presenting complaint. All EDs have the equipment and expertise readily available, and so effectively could act as a quasi-screening clinic for SCD pathologies, with minimal drain on resources. Perhaps there is potential for a local/regional quality improvement project here – an added string to the EM bow. A point of discussion during the Q&A was the feasibility of introducing a military screening programme. It would be a massive (and therefore expensive) undertaking considering there are approximately 160,000 total regular forces. There is also the potential for removing healthy, highly trained soldiers from active duty because of a ‘borderline abnormal’ ECGs (red herrings). If genuine pathology is identified, is it the responsibility of the military to arrange appropriate treatment and follow-up? Further cost implications. As Medical Director for the London Marathon, Professor Sanjay explained they don’t screen all runners because their limited staff would be drowning in ECGs if they did. The same obstacle would lie in the way of a military screening programme. One potential solution, which I wish I’d volunteered at the conference, would be to introduce machine learning technology for ECG interpretation. Huge efficiency gains, cost savings, and (dare I say it) avoidance of human error, could be on the cards. Of course, the utility of artificial intelligence in healthcare is a far from proven. More concrete evidence of its efficacy is required, a governance system needs to be introduced, and most medical professionals will require a considerable attitude adjustment before handing over any of their professional responsibilities to a machine. However, if and when the technology starts to gain traction in healthcare (which, in my opinion, is just around the corner), large scale ECG interpretation seems like low hanging fruit.